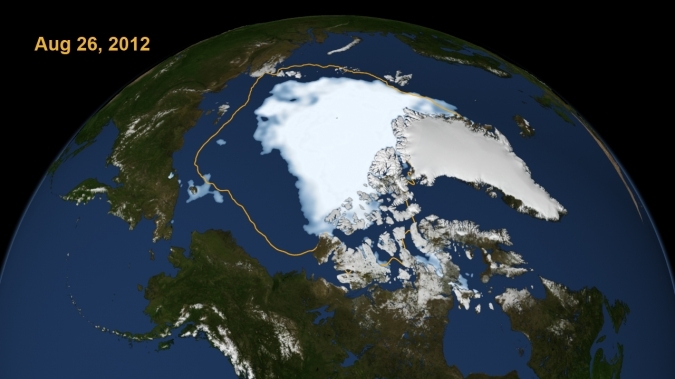 Thanks to NASA, the Arctic (and Antarctic) "wastes" are supervised closely these days. But there is nothing more critical than the ice habitat. Polar bears and whales can be tracked by remote satellite and many critical features of both land and sea conditions can be monitored. Enough to tell us that since the 2007 low ebb, Arctic sea ice has now achieved a new low extent. Even lower is the forecast, of course as the Autumn sun proceeds to demolish hopes and fantasies about retaining the oceanic frozen mass. Greenland is suffering from glacier loss, too, so even the limited Arctic earth is giving up its chill. In October we will hear the worst about a 5% loss at least, as reports on the whole season are given, but now is the time to worry and probably act. Sooner rather than later action is certainly the only solution to the global warming problems we have inflicted on the oceans. Above: Arctic sea ice extent for August 26, 2012 (right) was 4.10 million square kilometers (1.58 million square miles), which was 70,000 square kilometers (27,000 square miles) below the September 18, 2007 daily extent of 4.17 million square kilometers (1.61 million square miles, left). 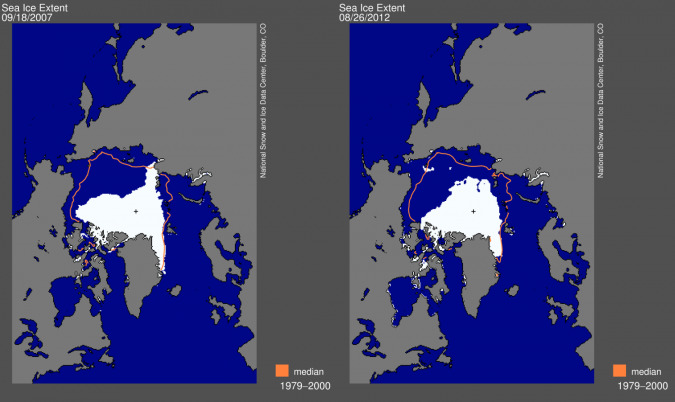 A loss of 5% of the ice will be the minimum over a full annual cycle. The orange line shows the 1979 to 2000 median extent for that day. The black cross indicates the geographic North Pole. The two maps from 2007 and then 2012 illustrate some interesting differences, one being the loss of more ice from Greenland's shores, but the pure percentage loss is most critical. Over the 30 years of satellite reconnaissance, there has been a 13% decline every decade in the summertime extent of ice. As more mass of ice is lost, it surely can't maintain its "cool," much longer. With quite cool temperatures operating this summer, 2007's arctic heat wave can no longer be held responsible. Joey Comiso, senior research scientist at NASA's Goddard Space Flight Center in Greenbelt, Md. Says simply, "Unlike 2007, temperatures were not unusually warm in the Arctic this summer. We are losing the thick component of the ice cover. And if you lose the thick component of the ice cover, the ice in the summer becomes very vulnerable." Above: The day that the sea ice dipped to its smallest extent ever recorded in more than three decades of satellite measurements. The data is from the U.S. Defense Meteorological Satellite Program's Special Sensor Microwave/Imager.